At a time when most of us suffer with dull, dry, lacklustre skin after the winter months a product that promises to give you radiance is always a winner. 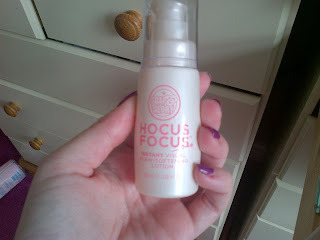 And now the tables seemed to have turned weather-wise and summer is definitely on its way, Soap and Glory's Hocus Focus is the perfect product to get your skin glowing alongside those sun rays! I started trying this product about a month ago, and even when I'm feeling stressed, tired or generally run down my skin looks healthy and radiant. It definitely perks you up! I've been using it as a subtle shimmer underneath my usual moisturiser, but you can just dab a little along the cheekbones and anywhere else you want highlighted. Or it can be mixed into your foundation for a "youthful, dewy, luminous look" as their blurb says.